This morning I was up early. I drank my coffee, did my internet duty (did you know mandatory surfing is now the law? It’s not.) and hopped into my Sauconys for a hour-long walk. An hour later I’m back at the computer, driven indoors by the rain. It’s been a dry couple of weeks, but earlier this spring it rained. And rained. And rained. And the most visible result of all this precipitation, in my yard at least, is a bumper crop of suburban bunnies. 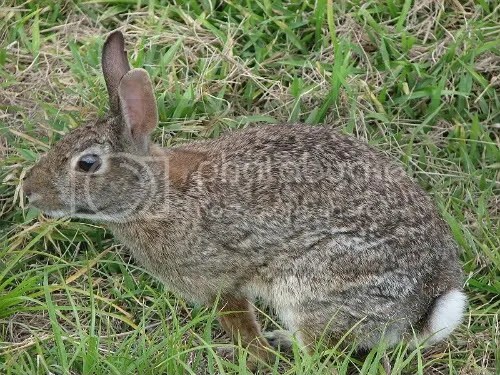 The wet weather, it seems, with the attendant abundance of vegetation, has caused the cottontails to multiply. Multiply like rabbits. Oh they’re cute. Cuuuuute. We love to watch them out back about an hour before dusk, when we’ve spotted as many as five to seven of the darling things, bunnin’ around and generally being adorable. But they’re also, you know, pests. They eat the aforementioned vegetation, which would include my sunflowers — if I’d planted them yet. They’re still on my windowsill, paralyzed by the fear of bunnies. I’ve nurtured these shoots, and I’ll be damned if I let the rabbits chow down on them. Not to mention the chipmunks. If there’s anything more populous in my yard than bunnies, it’s these adorable little bastards, who have taken over not only my front yard, but the dank region below my deck. This steamy place now reeks like the monkey cage at the zoo, the result I am positive of a thriving colony of Tamias striatus that would rival the meerkat lodge. All this might be about to change, however. Upon discovering the below-decks reek, I’ve about decided that it’s time to become a mass murderer and thin the population around chez Soileau. I know. Look that that darling little face. From someone who was hell-bent on becoming a veterinarian (ages 9-18) it’s startling news that I would go from self-appointed guardian of the animal universe to slayer of rodents. But there is one last-ditch effort that I’m willing to make, which may save the bun and munk populations from certain death. I’m going to fight hares with hair. In my garage right now I have stored away, next to the warfarin-laced rat poison, a bag of hair. It’s handy, you know, whenever someone announces that their coworkers are dumber’n a bag of hair, I can just trot out there and check. No, really. It’s reputed to be a rabbit and rodent repellent, and my hairdresser, April, kindly provided me with a whole bag of mine, plus that of her previous four customers. So, for the time being, at least, I’m not going to have any blood on my hands — figuratively speaking. When the rain lets up, I plan on getting those sunflower shoots in the ground before it’s August and I’ve got a forest of sunflower seedlings obscuring the view in the breakfast nook. But if the hair doesn’t prove hair-raising enough, mass murder it is. Just don’t tell April. She’ll cut me off, for sure.